The hall ticket for the examination is for the post of Constables. It will be released soon. 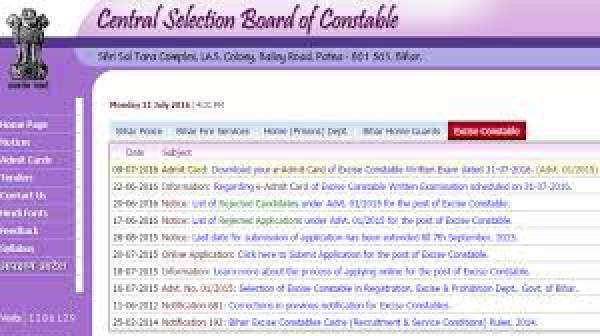 Those who had applied for the Bihar state of Central Selection Board of Constable examination can download the BEC Admit Cards 2016 from the official website. The official website is www.csbc.bih.nic.in. The Central Selection Board Of Examination, Bihar has to fill the vacancies for the post of constables. There are total 831 vacancies. The board has released notification for the admit cards. According to the eligibility norms, all those candidates who are eligible for the post have submitted their application. As the examination will be held on the last week of the July, hence candidates must have to download the hall tickets as released by CSBC. There are total 831 posts in which there are 390 posts for general category, 270 posts for BC, 29 posts for women in BC, 133 posts for SC, 09 posts for ST categories. The exam will be held on 31st July 2016. All the candidates are informed that it is compulsory for the candidates appeared for the examination to carry the hall ticket during the exam because it is an important document with the help they are allowed to be appeared in the examination. Without it candidates are not allowed to attend the exam. The candidates appeared for the examination have to follow the steps in order to download the hall ticket for the entry into the examination. The first step is to reach the official website of www.csbc.bih.nic.in. Then the homepage will be available on the screen. Here click on the link of hall tickets. Access the link “Download Your e-admit cards Excise Constable Written Exam”. Then enter the details of the candidates such as application number, date of birth and other information in the required field. Then click on “SUBMIT”. Then hall ticket will be appeared on the screen. One have to download the admit card and take the print out of the hall tickets. This admit card is mandatory to appear in the examination. Without it the candidates are not allowed to sit in the exam.